Crispus is a specific or varietal epithet usually used for plants that have leaves with wavy or curly edges but can also be used for plants with curly leaves. In addition, it is applied to a small red alga (Chondrus crispus), and to curly thistle (Carduus crispus) that has curly hairs on its leaves. Plants identified by the specific or varietal epithet, crispus, come from diverse habitats. Curly pondweed (Potamogeton crispus), is a native of Eurasia but has been introduced into the US where it is considered a noxious weed. The plant is aquatic and the leaves are always submerged. 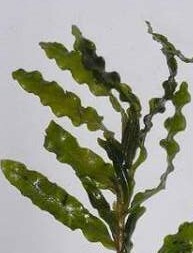 Mature leaves usually have wavy margins. Curly dock (Rumex crispus), is another weed with the epithet crispus but it terrestrial. A native of Europe and western Asia, it is common in disturbed soil and has become invasive in many areas of the US. Although its leaves are edible, the high oxalic acid content can irritate the urinary tract and cause kidney stones, so leaves should be eaten in moderation. On the ornamental side, the sun rose, Cistus crispus, has wrinkled foliage. It is a small (2’ H x 3’ W) shrub native to southwestern Europe and western North Africa where it does well in full sun and lean soil. The flowers are magenta with a center of gold stamens. 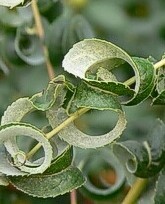 Weeping willow (Salix babilonica) ‘Crispa’, has spirally curled leaves. The tree grows up to forty feet high and is hardy in USDA zones 6 to 9.